Get ready to party with the best of them as Status Quo and Chas and Dave present a rocking and rolling festive special. 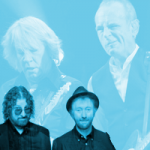 Status Quo will be live at the SSE Hydro in Glasgow on Sunday 7 December 2014. The Quo are getting to be a dab hand at these kind of shows and have previously taken the likes of Roy Wood and Wizzard, Kim Wilde and Suzi Quatro with them. This time along it’s the legendary Rockney duo Chas and Dave. Promising a night packed full of hits and more, plus support tickets for this will sell out in advance. For anybody booking, Level 3 is up the ‘apple and pears’ so may not be suitable for folk with an aversion to heights.